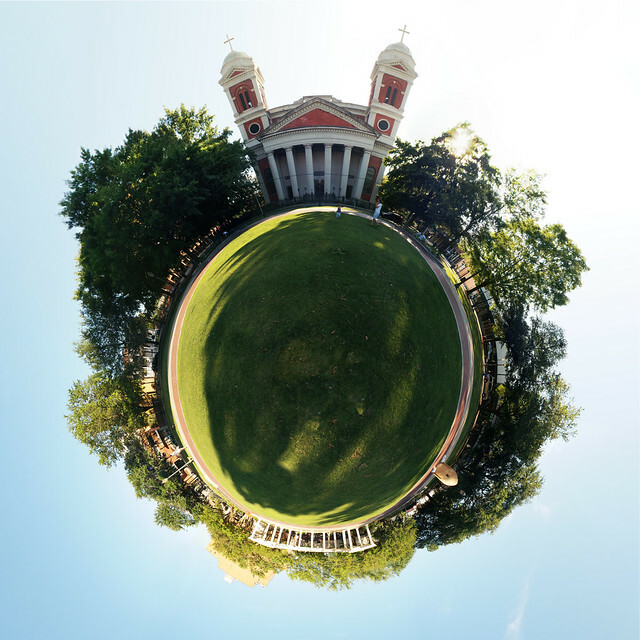 Wee Mobile Alabama (Cathedral of the Immaculate Conception), a photo by avhell on Flickr. 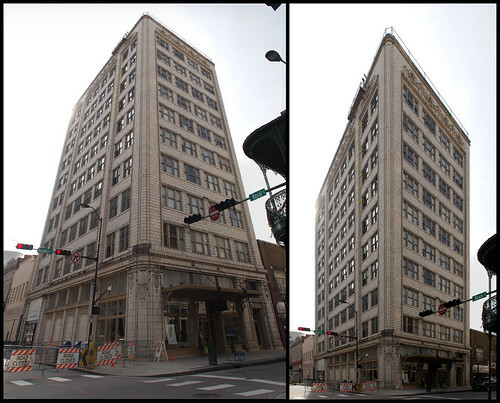 I’ve been a fan of shooting panoramic images for as long as I’ve had a digital camera. Usually out of a desire to expand the capabilities of early fixed focal length point and shoot cameras to get a wider view of the world. Taken to its logical extreme, we get images like these! Once all the images are captured to fully view the scene in a full sphere, you can re-map the resulting panorama to any projection type you would like. 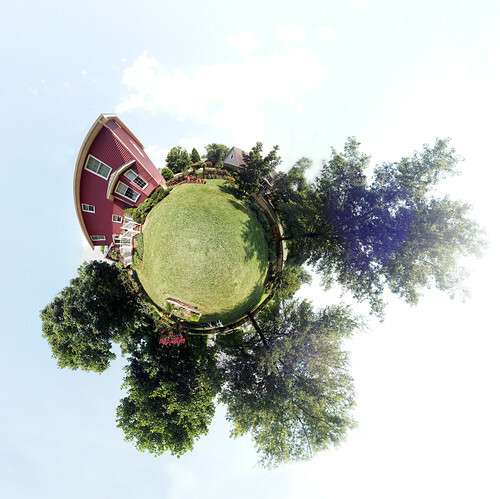 In the case of the planet, the panorama projection was to be stereographic with one of the poles centered in the resulting image (the ground directly beneath my tripod). These are a lot of fun to make, and can be quite striking once you are familiar with how they work. In my case I just used my tripod (no panoramic head), and proceeded to shoot 44 different overlapping images, creating a complete map of images surrounding my camera location. Some people will advocate the use of a panoramic head, like the Nodal Ninja seen on the left. The point of devices like this is to keep nasty parallax issues from cropping up between object of different distances from the lens (there is a point sometimes referred to as the “nodal point” or the “entrance pupil” about which if you rotate, there should be no parallax issues between images - here is a great tutorial on finding one for your camera on a panoramic head). I was in a park with no objects in my foreground, so I opted to not bother with a pano head, and just went with a normal tripod - figuring I would let the software work it out for me mostly. I am pretty pleased with the results overall (though I did need to manually tweak a few things, it wasn’t too bad). Speaking of which, the software I’ve been using for years is the open source project Hugin. This is basically my go-to software for just about any advanced image manipulation geometrically. I’ve used it for panoramas, of course, but I’ve also found it really useful for re-projecting other images and for correcting lens distortions when dealing with RAW files from my camera. 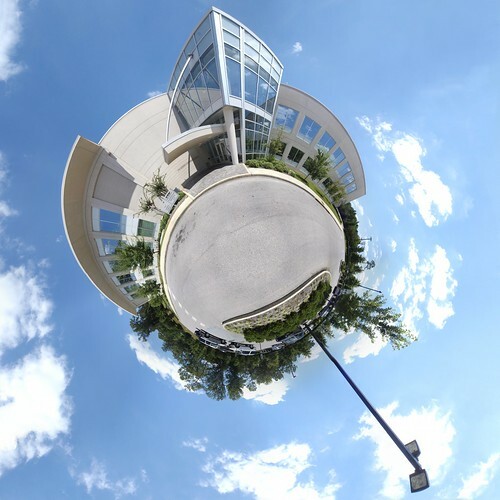 University of South Alabama - Technology & Research Park by avhell on Flickr. 4th of July Wee by avhell on Flickr.